We extend a special welcome to those who are single, married, divorced, gay, filthy rich, dirt poor, y no habla Ingles. We extend a special welcome to those who are crying new-borns, skinny as a rail or could afford to lose a few pounds. That’s wonderful, Jason. I’m adapting it for a URC in Swansea — e.g., “sing like Katherine Jenkins” and “more Reformed than John Calvin” — and using it for tomorrow’s Call to Worship. :) you’re welcome. great post by the way and thank you for sharing. 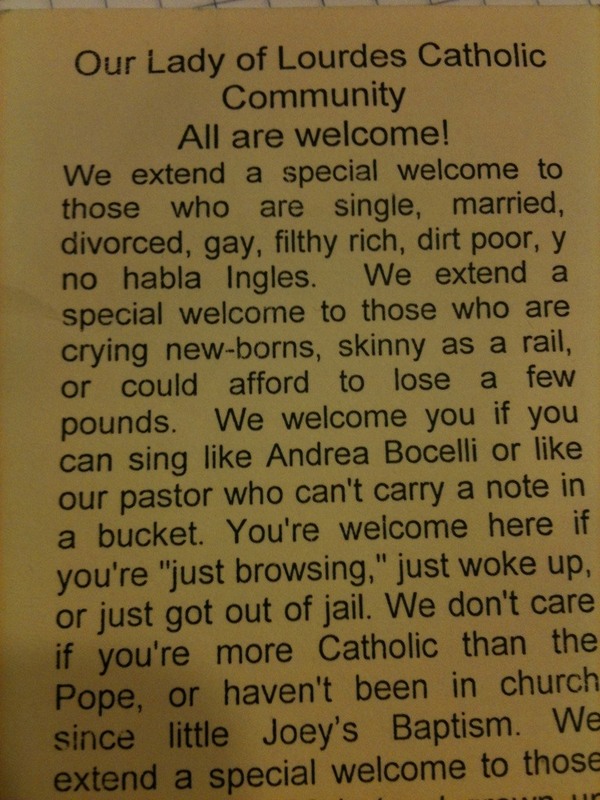 Wonderful invitation – an inspiration to all Christians to remember how to be hospitable and welcoming. Thank you Jason – may I use this in a church newsletter (with acknowledgments of course)? You’re welcome Jillian. It’s not ‘my’ sign, but I can’t imagine whoever its author was not being happy with you using it (so long as you’re not trying to make a buck out of it). So go for it! Hospitality is to be shared, after all. A wonderful witness in itself. non-judgemental, compassionate, and loving. Geoff Bingham would approve, I’m sure.